For other uses, see Bakufu (disambiguation). “Shogunate" or "bakufu" (幕府:ばくふ) is a term used for a shogun's office or government. The term “bakufu” (meaning "an office in the tent," or “field headquarters”), referred to the headquarters, or administration, of a general on the battlefield, and implied that such an administration was meant to be temporary. Shogun (将軍:しょうぐん, shōgun), was a military rank and the historical title of the feudal administrator who served as the Emperor’s military deputy and actual ruler of Japan from the twelfth until the nineteenth century. The title “shogun” is the short form of sei-i taishōgun (征夷大将軍:せいいたいしょうぐん); the rank was equivalent to "general," the highest officer in an army. The Imperial Court in Kyoto awarded this title first to the leaders of military expeditions against eastern people, and later to the heads of military governments at various times during the history of Japan. In 1185, Minamoto no Yoritomo unified a large area of Japan and established himself as the first shogun of the first bakufu, the Kamakura shogunate. He received the title sei-i taishōgun, which was passed on to the leaders of three successive bakufu. The Emperor and his court continued to rule as figureheads, while the shoguns maintained political control of the nation. The title of “Shogun” remained in use for the de facto ruler of Japan until the Meiji Restoration restored the emperor to the central position of political power. The title itself, Sei-i-tai Shogun ["great general who subdues the eastern barbarians" ], dates back to 794 and originally meant commander of the imperial armies who led the campaigns against the Ainu in northern Japan. The shogunate as a military administrative system was established by Yoritomo after 1185 and was known as the Bakufu [literally, army headquarters]. The imperial court at Kyoto continued to exist, but effective power and actual administration were in the hands of the hereditary shoguns. The emperor's position in the bakufu system was unique. He was isolated from the outside world by several layers of advisers, but could still issue imperial orders to members of the bakufu, orders they were obliged to follow. However, the bakufu often used their military prowess to coerce the emperor into keeping his mouth shut. The title of “shogun” was first used during the Heian period, when it was occasionally bestowed on a general after a successful campaign. Its earliest known use was in 794. The term sei-i taishōgun means "great general who subdues the eastern barbarians." "Eastern barbarian" is one of several ancient terms for various groups who lived in eastern area and had not yet become subject to the central government. Among them were the aboriginal Ainu people who once inhabited Honshū in addition to Hokkaidō. Originally, the title of Seii Taishogun was given to military commanders during the early Heian Period for the duration of military campaigns against the Emishi (蝦夷, pre-seventh century 毛人), people living in northeastern Japan (the present-day Tohoku region), known in contemporary sources as michi no oku, who opposed and resisted the governance of the Imperial court in Kyoto during the late Nara and early Heian periods. The most famous of these “shogun” was Sakanoue no Tamuramaro, who conquered the Emishi in the name of Emperor Kammu. The title was abandoned in the later Heian period, after the Ainu had been either subjugated or driven to Hokkaidō. In the late Heian Period, Minamoto no Yoshinaka was named sei-i taishōgun after he marched into Kyoto during the Genpei Wars, only to be killed soon afterward by his cousin, Minamoto no Yoshitsune. Yositsune then helped his half-brother, Minamoto Yoritomo, subdue his rivals before he himself was betrayed and killed. In 1185, when the Minamoto finally defeated the Taira clan. Minamoto Yoritomo usurped the emperor’s power and established a feudal system of government based in Kamakura, the Kamakura bakufu. The emperors of Japan and the aristocracy in Kyoto remained in place as figureheads, appointing civil governors, collecting taxes, and governing the area surrounding the capital, but real political power was in the hands of the shogun and bakufu, or military samurai government. In 1192, Yoritomo was awarded the title of Sei-i Taishōgun by the emperor. The political system headed by a shogun became known as a "shogunate." The emperors occupied a unique position in the bakufu system; they were isolated from the world by an entourage of nobles and courtiers, but could still issue imperial orders that members of the bakufu were obliged to follow. There were frequent intrigues between the bakufu, which tried to coerce the imperial court into cooperating, and the emperor, who frequently attempted to exercise power and undermine the bakufu by manipulating clan loyalties. The shogunate did not remain in the hands of the Minamoto clan for long. When Yoritomo died in 1199, his widow, from the Hojo clan, tokk religious vows and became a Buddhist nun. Known as the "Nun Shogun," she displaced the Minamoto heir and installed another son, who was soon assassinated, as shogun. From that point onwards, the Hojo clan controlled the bakufu while the Minamoto nominally occupied the position of shogun. The feudal lords retained actual control of their domains, while swearing allegiance to the shogun. In 1221, the imperial court led an uprising against the bakufu, in an attempt to regain control of the government but failed, largely because the shogunate had been organized in such a way as to retain the loyalty of the samurai lords. The greatest threat to the Kamakura bakufu was the invasion of Japan by the Mongols. In 1266, Kublai Khan declared himself Emperor of China, established the Yuan dynasy, and sent representatives of the Mongolian court to Japan to demand its immediate surrender. The imperial court was terrified, but the Kamakura shogunate refused and sent the representatives home. In November of 1274, the Mongols, having successfully conquered Korea, sent 23,000 soldiers to invade Japan. They landed at Hakata Bay and made some initial advances, but a combination of bad weather, heavy casualties, lack of supplies and internal dissension caused them to withdraw. In the spring of 1281, a second attempted Mongol invasion landed at numerous points along the coast of Kyushu, but the invaders were driven back to their ships, which were then destroyed by the famous two-day “kamikaze” typhoon. Though the Kamakura shogunate had won a great military victory, there were no military spoils with which to reward the warriors, and agricultural production had been devastated. Many of the samurai became disgruntled and began to demand a change of government. In 1318, a new Emperor, Go-Daigo, who was determined to rule Japan himself, ascended the throne. In 1331, he rose in revolt against the Kamakura bakufu, but was captured and exiled within a year. When Go-Daigo defied the Kamakura bakufu and returned from exile with his supporters, a trusted Kamakura general, Ashikaga Takauji, who had been sent to confront him, turned against the bakufu, capturing Kyoto in the name of the Emperor Go-Daigo, while another general, Nitta Yoshisada, stormed Kamakura and destroyed the bakufu. The fall of the Kamakura bakufu was followed by a three-year period from 1133- 1136, known as the Kemmu Restoration (建武の新政; Kemmu no shinsei), during which Emperor Go-Daigo attempted to re-establish Imperial control. After the fall of the Kamakura shogunate in 1333, Prince Morinaga or Moriyoshi (護良親王)（1308 - August 12, 1335), son of Emperor Go-Daigo, was awarded the title of Sei-i Taishōgun and put in charge of the military. However, Ashikaga Tadayoshi, a descendant of the Minamoto shoguns, marched on Kyoto with the military support of warlords who sought a return to a government controlled by the samurai. After a decisive victory at the Battle of Minatogawa, Ashikaga Takauji entered Kyoto, installed a new line of emperors, under the control of his shogunate, and established a new bakufu in the Muromachi district of Kyoto, known as the Muromachi Bakufu. 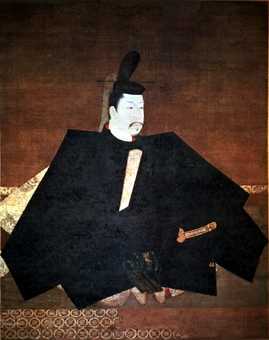 Prince Moriyoshi was put under house arrest and killed in 1335. Emperor Go-Daigo fled to Yoshino, where he set up a new imperial court. From 1337 to 1392, both the Yamato and Kyoto courts claimed imperial power. The Ashikaga shogunate lasted from 1338 to 1573, known as the Muromachi period. The Kamakura shogunate had co-existed with the imperial court in Kyoto; Ashikaga took over the remnants of the imperial government. Nevertheless, the Ashikaga bakufu was not as strong as the Kamakura had been and was plagued by civil war. It was not until the rule of Ashikaga Yoshimitsu (as third shogun, 1368-1394, and chancellor, 1394-1408) that a semblance of order emerged. Ashikaga Yoshimitsu allowed constables, who had had limited powers during the Kamakura period, to become strong regional rulers, later called daimyo (from dai, meaning great, and myoden, meanng named lands). In time, a balance of power evolved between the shogun and the daimyo; the three most prominent daimyo families rotated as deputies to the shogun at Kyoto. In 1392, Asikaga Yoshimitsu finally succeeded in reunifying the Northern Court and the Southern Court, but despite his promise of a balance between the imperial lines, the Northern Court maintained control over the throne. After Yoshimitsu, the line of shoguns gradually weakened and increasingly lost power to the daimyo and other regional strongmen. The shogun was no longer able to decide imperial succession, and the daimyo backed their own candidates. In time, the Ashikaga family had its own succession problems, resulting finally in the Onin War (1467-1477), which left Kyoto devastated and effectively ended the national authority of the bakufu. The power vacuum that ensued launched a century of anarchy. The so-called transitional shoguns, of 1568–1598, did not receive the title of sei-i taishōgun from the emperor and did not establish shogunates, but did, for a period, hold power over the emperor and most of Japan. Nagoya Castle, built by Tokugawa Ieyasu in 1609, is one of the most wonderful castles in Japan (on par with Osaka Castle and Kumamoto Castle). 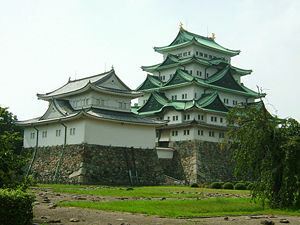 It was burned down in an air raid during World War II, and rebuilt by the city of Nagoya in 1959. The castle's tower is decorated with famous golden Shachi-Hoko Statue, a mythic creature with the head of a tiger and the body of a fish. After almost a century of civil war as the various daimyo vied for power, a series of powerful warlords including Takeda Shingen, Oda Nobunaga, Hideyoshi Toyotomi and Tokugawa Ieyasu succeeded and defeating and unifying most of the clans under one leadership. In October of 1600, at the Battle of Sekigahara (関ヶ原の戦い), the biggest and perhaps the most important battle in Japanese history, Tokugawa Ieyasu crushed his opponents from western Japan and became de facto ruler. In 1603, the Emperor gave Ieyasu the title of sei-i taishōgun, conferring on him the right to rule in the name of the Emperor. Tokugawa established a government at Edo (now known as Tokyo), and set up a strict hierarchical government which remained in power for 250 years, until the Meiji Restoration in 1868. Tokugawa established a highly-organized Confucian social and political order which put an end to social mobility. Most samurai lost direct possession of the land; all land ownership was concentrated in the hand of the about three hundred daimyo. Those related to the Tokugawa clan were known as shimpan daimyo; the daimyo who were vassals of the Tokugawa before the battle of Sekigahara were called fudai daimyo (hereditary lords); those who submitted after Sekigahara were tozama (outside) lords. The samurai (warriors) had to choose between giving up their swords and becoming peasants, or moving to the cities of their feudal lord and become paid retainers. The daimyo were placed under the tight control of the shogunate, under a system was called sankin kotai, which stipulated that their families had to reside in Edo, and the daimyo themselves had to reside alternately in Edo for one year, and in their province (han) for the next. This system ensured that the daimyo did not amass too much wealth or localized political power. The population was divided into four classes: the samurai (about five percent of the population), peasants (more than 80 percent of the population), craftsmen, and below them, merchants. Samurai, craftsmen and merchants lived, each restricted to their own quarter, in the cities that were built around the castles of the daimyo. The political system evolved into what historians call bakuhan, a combination of the terms bakufu and han (domains) to describe the government and society of the period. In the bakuhan, the shogun had national authority and the daimyo had regional authority, a new unity in the feudal structure, which had an increasingly large bureaucracy to administer the mixture of centralized and decentralized authorities. Japan developed many of its modern social and economic structures during the Edo period. Castle towns became centers for commerce and manufacturing, and a prosperous middle class of merchants and artisans emerged. Although the Tokugawa shogunate attempted to enforce isolation from foreign influences, there was some foreign trade. In the late Edo period, a variety of factors weakened the shogunate, including a top-heavy bureaucracy, antiquated economic policies, and rising unrest among the lower classes. Industrialization in the West forced the shogunate to seek foreign knowledge and technology in order to maintain their military strength. A final crisis was provoked when the United States forced Japan to open her ports, and the daimyo became divided over how to deal with the threat of foreign colonization. The Edo Period ended with the Meiji Restoration on January 3, 1868, when power was restored to the emperor and the last Tokugawa shogun was reduced to the ranks of the common daimyo and the title sei-i taishōgun was abolished. During the Boshin War (1868-1869), when the Tokugawa shogunate was defeated by samurai seeking to return power to the imperial court, the title was conferred for the last time by Kitashirakawa Yoshihisa, the Imperial prince who had declared himself Emperor Tōbu (Tōbu-tennō; 東武天皇), on Date Yoshikuni, the lord of Sendai han. This page was last modified on 8 December 2012, at 16:26.